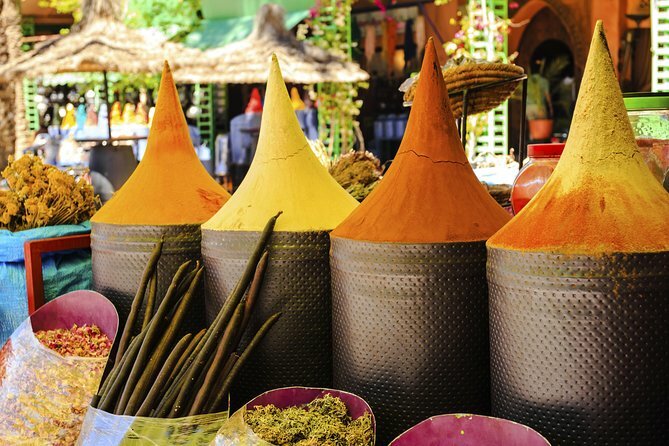 This specially designed tour is the perfect way to explore the souks of Marrakech´s old medina! Bargain for amazing deals and see the famous Djemaa El Fna Square. The better way to discover Marrakech is to walk in its labyrinth narrow streets and souks where you can see a variety of quarters established by craftsmen, according to a structured system of corporation. The most famous souk of Marrakech is that one which include the Rue du Souk Samarine which leads into the place Rahba Kedima, where a slave market was once held . There are also a few apothecary shops here and there . Djemaa El Fna which is the heart of Marrakech , is a traditional meeting place for peasants and merchants from the Sous region, the High atlas and the South. In the mornings this large square is crowded with fruit and spice sellers, guerrab with their leather water bottles and metal drinking cups, basket sellers, ironmongers and Barbers. In the afternoons come the Gnaoua dancers descended from former Guinean slaves, musicians, story tellers, snake charmers and entertainers with performing monkeys! As the tour start after lunch, participants must join the group at the departure point in front of the restaurant palais raabe located at the bottom of the police station's street on the famous Djemaa El Fna Square. Please make sure you are the departure point at least 15 minutes before scheduled departure time.